Want to show your love for Voltes V AND have your shirt design available nationwide through Giordano? 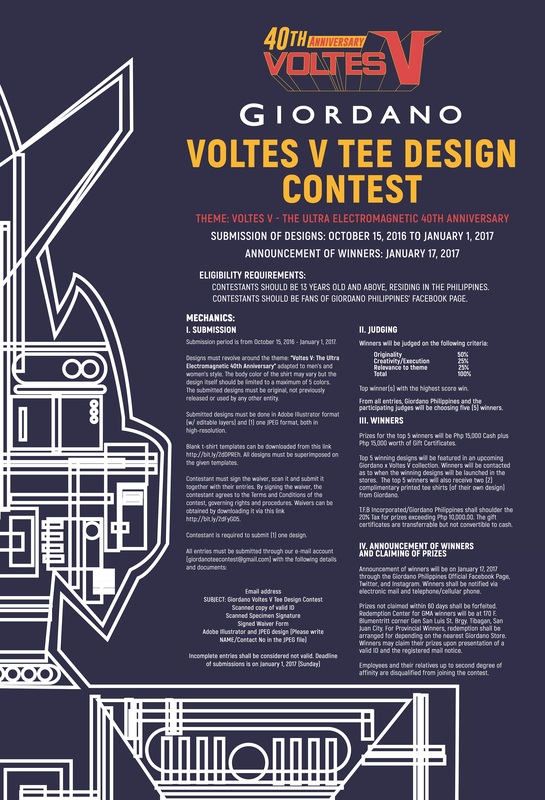 Well this is your chance as the clothing brand is currenetly launching its Voltes V shirt design contest! In preparation for the show’s 40th anniversary, Giordano Philippines has recently launched a shirt design contest for the iconic animated series. The shirt designing competition’s theme would be “Voltes V: The Ultra Electromagnetic 40th Anniversary” and must be applicable to men’s and women’s style. The body color of the shirt may vary but the design to be submitted must only have a maximum of five colors. A total of five winners will be chosen based on creativity, originality and relevance to the aforementioned theme. Winners will then recieve Php 15,000 in cash plus Php 15,000 worth of gift certificates. Designs must be submitted in high resolution both in Adobe Illustrator format with editable layers and one JPEG format. Blank t-shirt templates can be downloaded from this link http://bit.ly/2dDPREh. All designs must be superimposed on the given templates. All entries, which include a scanned copy of valid ID, scanned specimen signature, signed waiver form, and designs in two formats, must be submitted to giordanoteecontest@gmail.com on or before January 1, 2017. Winners will be announced on January 17, 2017 through the Giordano Philippines official Facebook page, Twitter, and Instagram. Winners will also be notified via email and mobile phones. 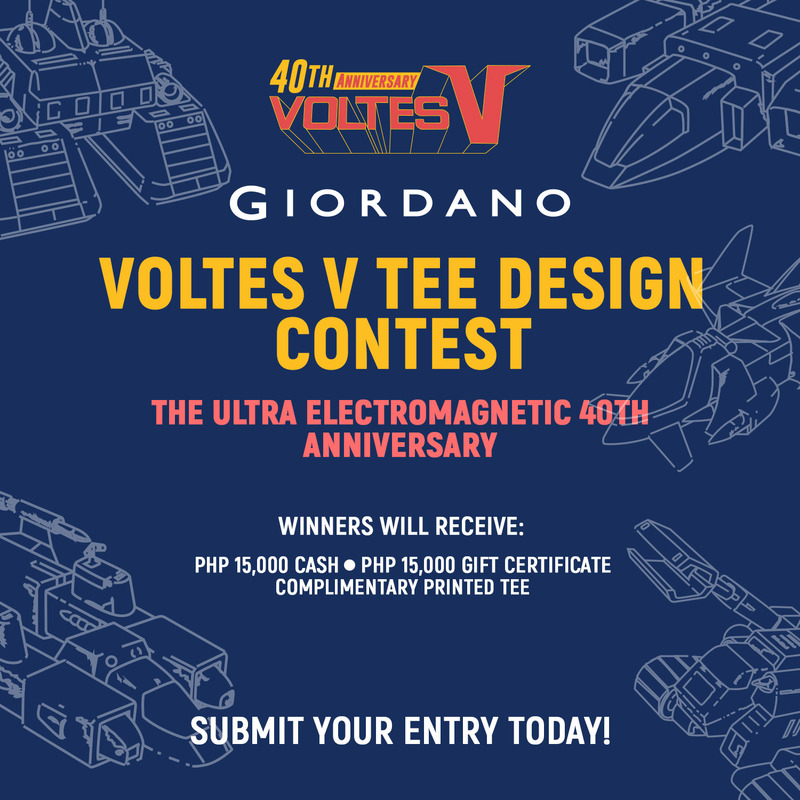 Show your creativity and send in your designs as Giordano celebrates Voltes V 40th electromagnetic anniversary. For more information, visit facebook.com/GiordanoPhilippines.